The man in Unit 4-C of the Pueblo County Jail has been in 23-hour-a-day lockdown for a year and a half now. Like most of his fellow residents in what’s known as administrative segregation, he is mentally ill. Brief interactions with the staff are nearly the only contact he has with the world outside his cramped cell. 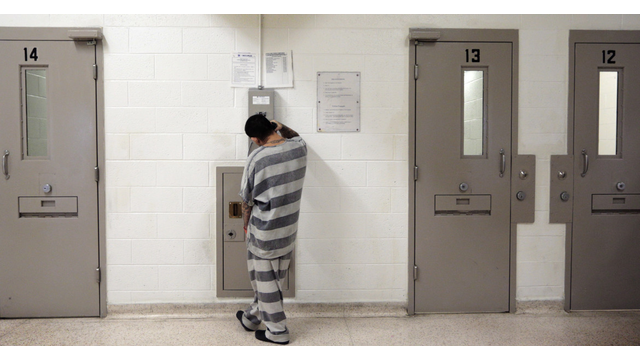 While a sheriffs deputy keeps watch, an inmate makes a phone call in Unit 4C of the Pueblo County, Colo., jail on April 4, 2014 during his single hour of time out of his cell each day. Inmates with mental illnesses are often placed under administrative segregation in 4C and other parts of the jail where they are kept isolated in their cells for 23 hours a day and their only human contact is with the guards. Those numbers and other issues with the mental health care system in Colorado are addressed in the Rocky Mountain PBS I-News series, Untreated: How ignoring mental health costs us all. The series shows that many who need mental health care in the state have a hard time finding it. Numerous Colorado sheriffs are outspoken in their belief that the mentally ill don't belong in their jails.